Most recipes include salt, so I often modify them to remove it. But I was happily surprised to come across a recipe for chicken that uses salt-free matzoh as a coating instead of high-salt breadcrumbs. Salt is in the recipe, but I would simply leave it out. The recipe comes from Blue Apron, which is a food home-delivery service. Matzoh Chicken from Blue Apron; hold the salt…and maybe the sugar. 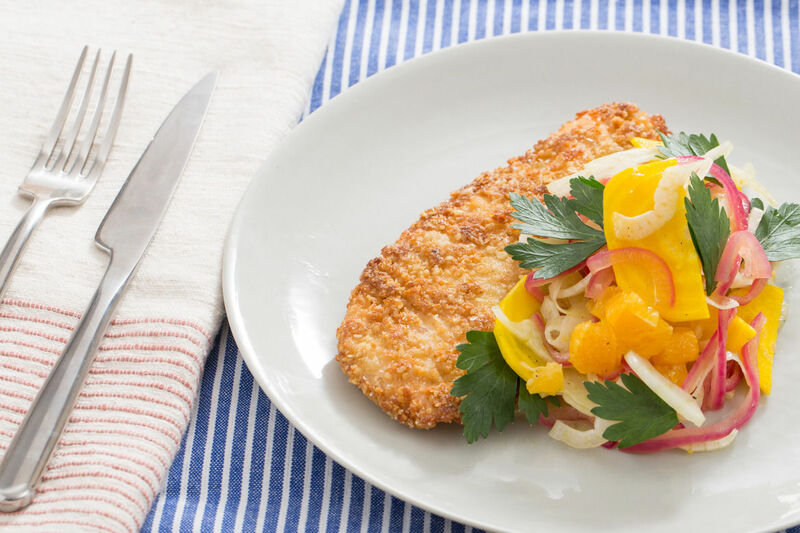 Click through to this Blue Apron recipe page to see not only how to make this, but great photos showing you a step-by-step guide. I’ve written about matzoh pizza I made, and served guests. It’s a great low-salt alternative to traditional pizza. Getting back to the new chicken recipe, however. The orange, fennel, onions and beets go into a side salad for the chicken. There’s mention of a pickling liquid that does include salt, I’d try to leave it out and see how it tastes. I eat fennel regularly, it doesn’t need salt to bring out its natural flavor. I plan to try this and report back on how it goes. Another note, there is sugar in this, if you’re watching your sugar, consider reducing or eliminating it. Lentil-crusted salmon: wild for me, maybe perfect for you?